Vintage Radio, Television and Hi-Fi are highly popular 'modern antiques' - and offer the added challenge for restorers of the repair of classic valve-based circuits. This highly readable book encompasses all aspects of buying, collecting, restoring, repairing, sourcing parts, professional services, clubs and societies, etc. Covering the technical side as well as collecting, this book offers the most comprehensive coverage available. The first half of the book deals primarily with technical aspects of restoration, what components are needed and where they can be found. The second half of the book provides a wealth of useful information: names and addresses of clubs and societies, auctions and antique fairs; a professional services directory; how to get hold of service data. Armed with this book the enthusiast will be able to tackle the restoration of a vintage machine with confidence. 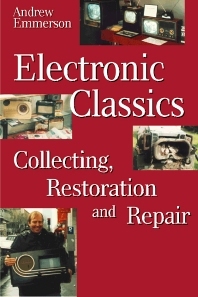 Introduction; Repairing and restoring; First-line repairs; Electrical Components; Cabinet and chassis; Finishing off a set; Buyer's guide - where to find parts; Service data - where to find it; Professional services directory; Clubs and societies; Recommended reading; Museums and other places to see professional restorations; Keeping track of your collection; What's it worth; Patronising dealers; Buying at auctions and antique fairs; Collector's luck; Safety; References; Index.